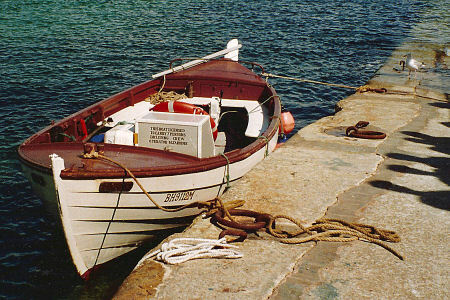 Alternative Boat Hire, Isle of Iona. 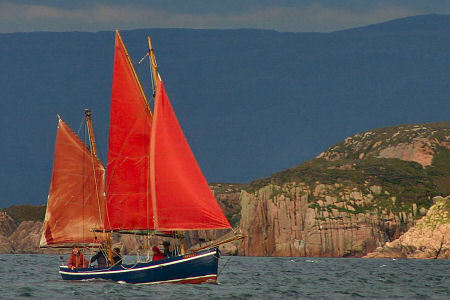 Sailing trips around Iona and the Ross of Mull. Fishing. Sightseeing. I first started running commercial trips in 1991 with a small open wooden boat called ‘Spreigeil’ (Gaelic for lively) which was of the Shetland model. She was only 19 feet long and sharp at both ends, so not a big boat for her size, however she was a well built and safe boat with a small inboard diesel engine and I had been using her in the area for 7 years before I decided to get the boat certificated. In those days the licensing was administered by the local authority and they allowed me to carry up to six passengers. The experiment was moderately popular and I decided I would try to get a bigger boat which would be capable in a wider range of weather and able to carry a few more passengers. I was never keen to run trips for larger numbers as I felt this would change the atmosphere of what I was trying to offer. After two years of looking I found, practically on my doorstep a boat which was not only suitable but had already been previously licensed under the same system. I bought the ‘Freya’ from Jeremy Mathew who had been running trips out of Croig in the north of Mull. One significant advantage was that she was suitable to run trips under sail. I carried out a fair bit of work on the boat, changing the rig to a more efficient set up. Installing a different engine and putting in a centre line propeller shaft was a major job necessitating replacement of the sternpost. In the nineties the MCA introduced their new ‘Code of Practice’ system for licensing which gave us a lot of headaches getting the boat to conform to a set of rules she had not been built to anticipate. After one very fraught winter we managed to get her through, but were restricted to a modified category 6 as she was an open boat. Over the 18 years that we had her she proved to be pretty much ideal for our purpose. The one thing that we could not change was the fact she was an open boat and this meant we knew we would never be able to do longer trips with paying passengers. In addition we were finding that we had many loyal customers who came back again and again and felt that it would be both good for them and good for me to be able to vary what we offered in the way of trips. Freya sailing the Sound of Iona. This could really only be achieved if we got a different boat. It took another two year search to find a suitable candidate and considerably longer to get her to ‘code’ standard. After looking at various boats including a few Cornish and Scottish luggers we found the Birthe Marie and I could see her potential, for better or worse I didn’t foresee all that she would need to realise her potential! So we said good bye to the ‘Freya’, she has gone south, but we have many memories of a simple boat which served a multitude of purposes, survived some tough conditions, took us all over the west coast from Ullapool to Ireland and out to Barra, round Skye and countless shorter trips closer to her own stamping ground where she was a familiar sight. I hope her next owners get as much out of her as we did. What we would like to do with Birthe Marie is more day trips, and visit some new places. She is also fit for occasional runs to some of the other Hebrides. We have an open mind, many are the possibilities…. Gaff rigged working vessels were built and sailed with remarkable skill by humble men.